Not sure what to get the Mrs. for a romantic Valentine’s Day dinner that will also set the mood? Well drop the little ones off at grandma’s and swing buy Burger King because they have you covered….if you live in Israel and are over 18 that is. This Valentine’s Day, 6 PM till close, they will be offering “Adult Meals”. They contain 2 Whoppers, 2 fries, 2 beers (yeah, beers) and 1 adult toy. 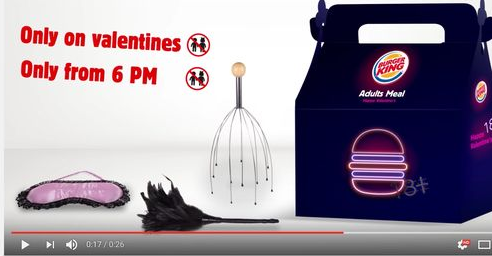 The adult toy options are a feather duster, head massager or a blindfold. Take note domestic fast food restaurants….take note. Next Construction Of The First Floating City Could Start In 2019!